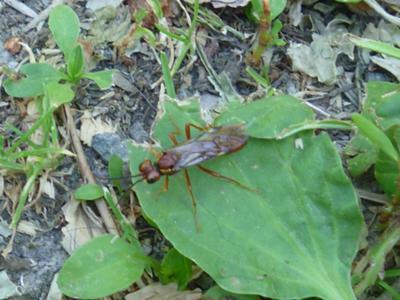 There are many different species of wasps - we're used to seeing the hornets and yellow jackets, but if you're observant, you'll see many others. Some are very solitary, and work alone. Some are hive oriented, similar to honey bees and bumble bees. 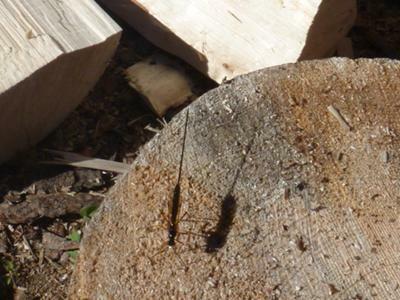 The Ichneumon wasp looks much worse that she really is - that's not an incredibly long stinger, it's an ovipositor, so she can lay eggs in crevices and cracks in wood for her larvae to be protected from predators. It's also so that there is a fully stocked larder for them when they first hatch. She finds a spot where there are bark beetles beneath the outer layer of wood, and that's where the eggs are laid. I wondered how it was accomplished, and one day I witnessed it in action - the wasp stands on her front legs, raising the ovipositor in the air, then brings it down underneath her, and holding it like a fire hose with two of the back legs, aims it into the cracks and crannies to lay the eggs. The sheer amount and quantity of wasps is amazing. They come in all shapes, sizes and colours and take care of a wide range of problems in the xeric garden. Without them, we would be overrun with caterpillars, adult moths and many other pests.